It took me so long to get through this book - 4 days - which is highly unusual for me since I tend to read/finish a book at one go. I requested a copy of The Traitor's Daughter because the cover seemed appealing but I'm sorry to say that the book was ordinary at best. I hate writing negative reviews so I'm apologizing in advance. From the beginning, The Traitor's Daughter was all over the place. Let me start with the prologue - I felt like I was thrown in the middle of a scene and had no clue of what was going on around me. Then the story abruptly shifts to a completely different situation that involved some kind of historic mafia or in this case, a mafia-like guy. It looked like Paula Brandon didn't know which path to take - big bad historic family leader or modern mafia - and got stuck in the middle. I noticed a lot of awkward phrases that didn't go well with the book. Really, it could've just been written better. 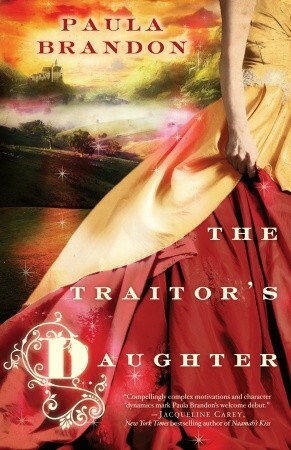 I had to literally force myself to get through A Traitor's Daughter. Maybe if the characters were better, I would've been okay with a not-so-great plot/writing. Or if there was some romance. I needed something to make me like it! Jianna is an annoying protagonist. She bugged me from the second she entered the story. I didn't care that she was spoiled but I sure as heck didn't want to read about a brat. What made it worse that her father, Aureste thought she was 'high spirited' and liked her for it when frankly, he should've told her to grow up. There's nothing that made any of the characters special and that's a major reason why I couldn't enjoy the book. The writing, frankly, lacked creativity and didn't manage to keep me engaged. I felt that the author was trying to write a unique historic novel but didn't know how. Instead, the entire novel was a confused story misrepresented as historic. I felt like reading the script of a bad, amateur film where the characters were a little too obvious. I'm giving this book two stars because really, it was okay. If the writing had been brushed up a little, the book could've been a decent read.